Corsair also introduced the Hydro H70 Core, this self-contained watercooling solution will retail for $89. It's based on the original H70 cooler with the difference that it comes without fans. 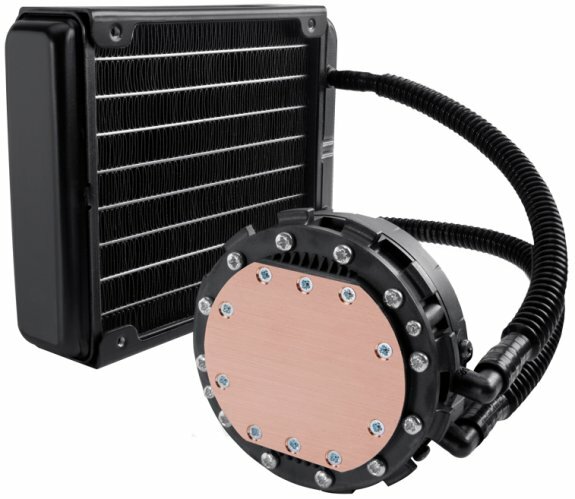 The product features a copper coldplate and an aluminium radiator with double the thickness of the company's standard radiator. The H70 Core is compatible with Intel LGA 1155/1156/1366/2011 and AMD Socket AM2/AM3/FM1 platforms. The Hydro Series H70 CORE is based on Corsair's award-winning Hydro Series H70 and is provided without the fans so users can personalize their cooling performance. It is aimed at experienced PC performance enthusiasts who already have 120mm fans, or who otherwise wish to supply their own fans. The H70 CORE includes a 38mm double thick radiator for superior cooling potential.